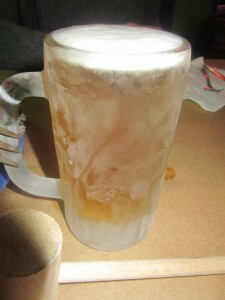 Crab Bag, Restaurant, Review, Crab House, Ocean City, Maryland, Natty Bohs?, Steamed Crabs, Haven!! By early afternoon, yesterday, we knew we were going to eat crabs. 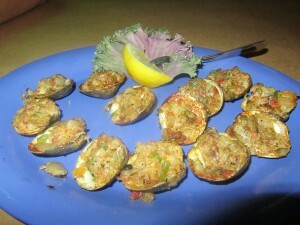 Years ago there was a small crab house in Ocean City, Maryland that we loved to go. As it happens, it was falling all around them. Anyway, that’s what Nolan, the owner, told me last night. 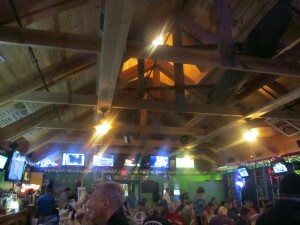 In the past few years it was rebuilt into one amazing crab house. You can smell Old Bay seasoning as you approach the restaurant. 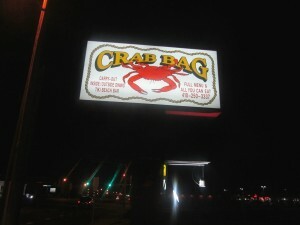 The Crab Bag is located at 13005 Coastal Highway, Ocean City, MD. Tel. is 410-250-3337. It opens at 9:00 a.m. serving breakfast and even though it is a full crab house, they offer so many other things to eat; seafood, steaks, hamburgers, sandwiches and salads. Their website is www.occrabbag.com but it is under construction at the moment. You can still go on it and download their menu. You can also find them on Facebook. I really go there for the crabs. It has been quite some time since I had been there. Crabs, at this time of the year, are coming pretty much from Louisiana. Last night they were offering all you can eat or you could order by the dozen. I ordered by the dozen; only the biggest ones. Crabs are also expensive during these months, but every single table was taken at the Crab Bag. 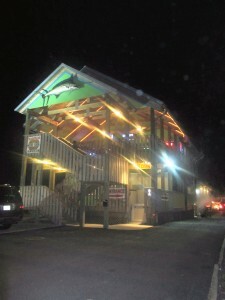 The Crab Bag has two floors with decks and outdoor dining, as well. It is February so everyone was indoors. There is nothing better than picking crabs in a crab house. It is loud, people are hammering away, drinking; a constant chatter. It is the perfect way to establish conversation. Your hands are fast working, grabbing those lumps of crab meat. But then, of course, if you are a true Baltimorean, then there is no better way to accompany those steamed, extra large crabs than with a Natty Boh. It has to be very cold too. Frosted glass, the best!! 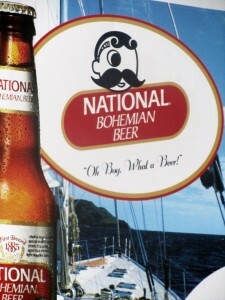 Natty Bohs (National Bohemian) is back in Baltimore after a 15 year absence. 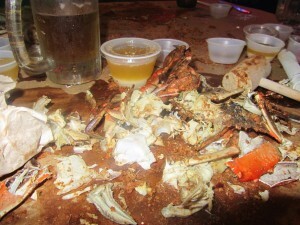 Steamed crabs and Natty Bohs define Baltimore. It has always been a tradition. We sat on the second level and that had another full bar but not as many tables. Mike was our waiter and he was busy. He was very good; attentive and fast. We started with some steamed clams; middle necks, chargrilled with fresh shallots, celery, green peppers, spices, Parmesan cheese and bacon. They were tasty and went fast. Then our crabs arrived, steaming hot. Mike asked us if we wanted vinegar, melted butter, and Old Bay. My answer? All of the above. 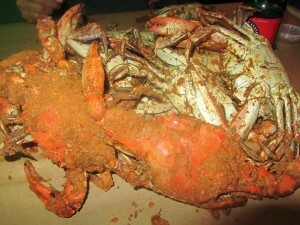 We dug into the crabs; they were heavy, juicy and sweet!! Perfection. 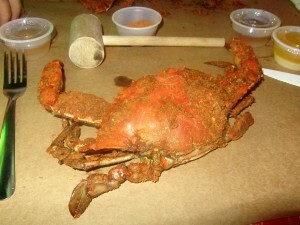 To me, there is nothing like the Maryland blue crab. Not in season? Then, this is the next best thing. 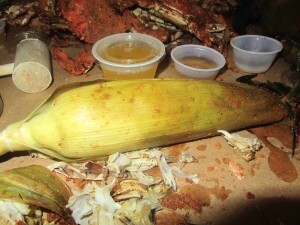 Some steamed corn complemented the crabs. The corn was nice and sweet for this time of the year. Don’t know where it was coming from, though. Nolan, the owner, stopped by to see how everything was. It really was very good and the service was the best. No complaints. We left the Crab Bag, still full of customers enjoying what the Delmarva Peninsula is known for. We told Nolan that we had come to get our crab fix for the week-end. He in turn told us that there are people that stop by 2 times a week for crabs. Cannot get enough!!! I agree because I can’t either. Talk to you soon….you know I will…. Bonnie’s story about losing her beloved dog, Checkers, probably hits home for anyone that has had a dog succumb to cancer. They do get our diseases, don’t they? Bonnie did not sit back; unlike most of us, she sprung into action. After going through that painful experience, a non-profit corporation was formed. Paws for the Cause, www.pawsforthecausefoundation.org. Please visit this website to see what it is all about. This charitable foundation has partnered with the American College of Veterinary Internal Medicine’s Chase Away Canine Cancer Program http://www.acvimfoundation.org. Check your calendars and see if you can attend the 1st Annual Chef’s Challenge on March 27th from 2:00 p.m. until 5:00 p.m. at The Cordrey Center in Millsboro, Delaware, near all the Delaware Beaches. The Cordrey Center is one of the newest venues in Delaware to hold events like this one. It sits on a historic property in a beautiful and secluded natural setting in Millsboro. The address is East Coast Garden Center, 30366 Cordrey Rd., Millsboro, DE 19966. Take Rt. 24 north, right on Mt. Joy Rd. by the Royal Farm’s store, then left of Cordrey Rd., 3/4 of a mile on the left. Website is http://www.thecordreycenter.com. Now that you know date, time and place, then let me tell you how much fun you will have if you attend the Chef’s Challenge. The price is $35 in Advance and $40 at the Door. This will include: Wine Tasting by Fenwick Wine Cellars, Beer Tasting by Twin Lakes Brewery, Entertainment and Silent and Live Auction. The featured 3 chefs will compete for various awards. There will be guest judges. Atendees can vote for their favorite, a 50/50 raffle will take place. The live auction will have: Chef’s packages, bed and breakfast-dinning package, golf packages, Cover of the 2011 Book of Dog Photography entitled “In Three Words”. You will experience lite fare by Fish On from Lewes and, of course, live entertainment. 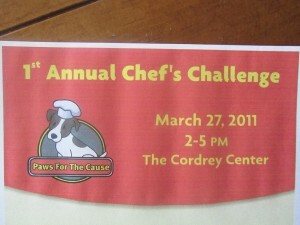 For more information, please call 302-644-7182, or visit www.pawsforthecausefoundation.org. I have written about my dog, Addy, in the past. She is a “rescued” dog and I have been thrilled to have given her a “forever” home. But, years ago I had a Springer Spaniel named Koko and I loved her to death. She developed diabetes and I went through the stages of helping her get through this devastating disease that also affects canines. I know what Bonnie went through and I hope you help her raise funds for Paws for the Cause and the American College of Veterinary Internal Medicine’s Chase Away Canine Cancer Program. Talk to you later…..have a great week-end…. I cannot believe that February is almost over. It was so funny; today I was at Rehoboth Auto Repair located in Rehoboth Beach when a local builder from Lewes came in and stated “everybody in this darn town is on vacation”, “my electrician is in Florida”, “my plumber is in South Florida”, but “”not me”. His next statement was “I like here like this, no tourists, no bugs, no heat”. That made me think about Delray Beach. It was crowded when I was there last month and I wonder if the locals are ready to take their town back. I think we do feel that way around here, at the end of the summer, but tourism is what makes our beaches. I don’t know, I think I am ready for Spring and Summer; for those visitors to arrive and see how lucky we are to live here. 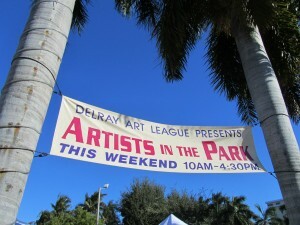 As usual, Delray Beach is full of activities this week-end. So here is a taste of what you can experience if you find yourselves in the warmer climate of that Village by the Sea. Until Sunday, 2/27/11 – The International Tennis Championships will still be going strong. Location? 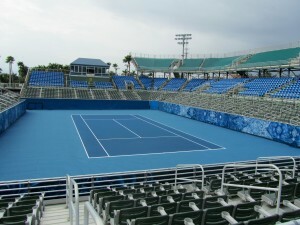 The Delray Beach Tennis Center, located at 201 West Atlantic Ave. Tel. 561-330-6000. But for the most complete information please log on to the website, www.yellowtennisball.com. I wrote a post on the Delray Tennis Center on 2/16, so scroll down to that date if you would like to see it. 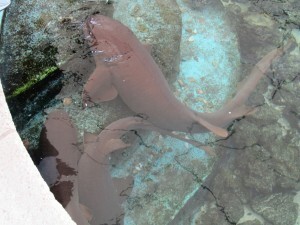 Friday, Saturday, Sunday, 2/25, 2/26, 2/27 – Sandoway House Nature Center – Shark Feeding. Friday and Saturday at 10:30 a.m. and on Sunday at 1:30 p.m. I wrote a post on this Nature Center on 2/15/11. Scroll down to the date. 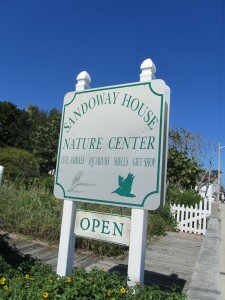 The Sandoway House Nature Center is located at 142 South Ocean Blvd., Tel. 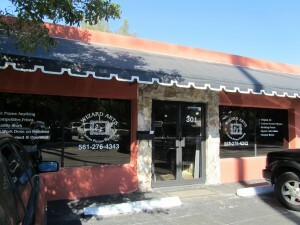 is 561-274-7263, website is www.sandowayhouse.org. There is a $4.00 admission fee. Besides the shark feeding, you will meet Bob. 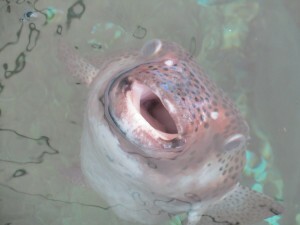 He is a Spotfin Burfish. Very aware when shark feeding is imminent. 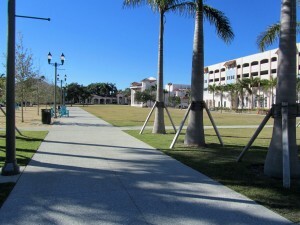 An exhibit called Ice Age Florida is in display until 3/29/2011. Friday, 2/25/11 – Cars As Art on the Avenue from 6:00 until 10:00 p.m. Together America’s Finest Classic Cars and Veteran Soldiers. The mission is to give the public an opportunity to meet and embrace our Wounded Hero’s, through the medium of Cars as Art. Location? Old School Square lawn on 51 N. Swinton. For more info, please visit www.carsasart.org. 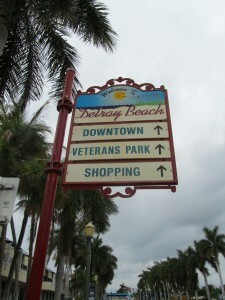 Friday, 2/25/11 – Gallery Walk – from 7:00 p.m. until 10:00 p.m. Delray is known for its art galleries. On Friday nights a lot of the participating galleries keep longer hours so you can get to know them. They serve some refreshments and appetizers, as well. One of those galleries is also a place where you can get framing done. It is Wizard Arts lcoated on 301 NE 1st Street., Tel. 561-276-4343. Website is www.wizardarts1.com. 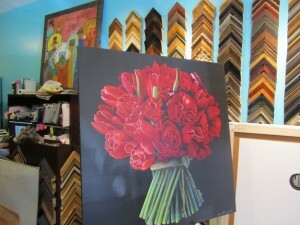 I met Carol through Tiffany Cant who is a Delray artist and who uses Wizard Arts for her framing. I have used her framing services several times and have been most pleased. Carol was professional, affordable and fast. Friday, 2/25/11 – Cycles – A Musical Journey at the Crest Theatre – Old School Square located at 51 N. Swinton. It will start at 8:00 p.m. until 10:00 p.m. Price $30. Cycles is an innovative blend of visual excitement and musical virtuosity, led by Delray’s percussionist, Drew Tucker. Check www.oldschool.org for tickets and more info. 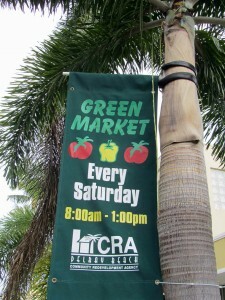 Saturday, 2/26/11 – Delray GreenMarket – SE 4th Avenue, south of Atlantic Avenue. 8:00 a.m. until 1:00 p.m. This Market is very popular and it is held every Saturday. 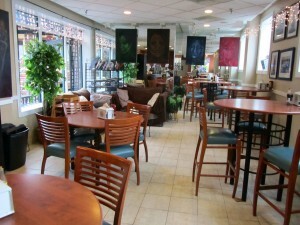 Music, flowers, baked goods and great food are among the many things that you will find early in the morning. Saturday, Sunday, 2/26, 2/27 – Artists in The Park – It is an open air art fair right at Veteran’s Park on Atlantic Ave., by the intracoastal. 10:00 a.m. until 4:30 p.m. Free. Saturday, Sunday, 2/26, 2/27 – 14th Downtown Craft Festival-Pineapple Grove Arts District at NE 4th Ave. from 10:00 a.m. until 5:00 p.m.
A Howard Alan Show with handmade jewelry, wall hangings, ceramics and so much more. It is also free. Some of the Nation’s top crafters will offer something for every taste and budget. There will be an expansive Green Market with plants, orchids, exotic flora and homemade soaps. For more information, please visit www.artfestival.com. Saturday, 2/26/11 – Grand Opening of Mootz’s Homemade Italian Ice at 2:00 p.m., located at 504 E. Atlantic Ave., inside the Antique Mall. Tel. 561-330-8280. Website? 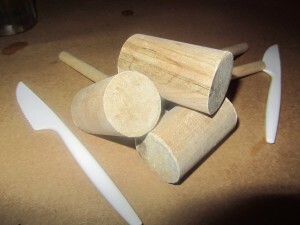 www.mootzsitalianice.com. You can find them on Facebook and Twitter. 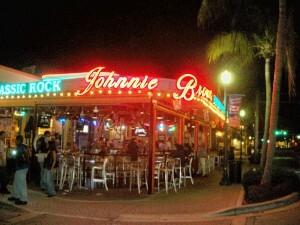 Friday, 2/25 – Ryan and The Rockers – 9:00 p.m. until 1:00 a.m. – This is a 5 man band based in South Florida playing the music of the 50’s and 60’s. Their website is www.ryanandtherockers.com. 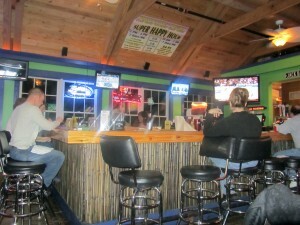 Saturday, 2/26 – Riptide – 9:00 p.m. until 1:00 a.m. This is a Boca based Rock and Blues Band. Their website is www.getripped.org. 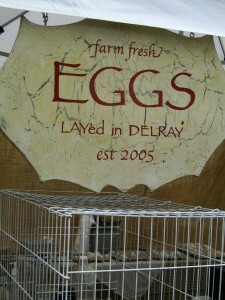 Note: Delray Beach has been known to grow pineapples so many years ago. 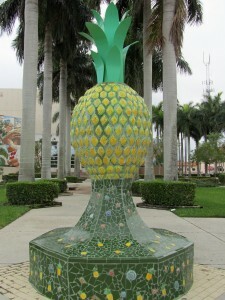 I am so glad that the pineapple is shown, mentioned and placed at strategic places in downtown Delray; such a symbol of hospitality and this Village by the Sea, certainly is. Have a great week-end…..talk to you later…. It was late in the day and Michael and I were doing some errands in Rehoboth Beach. 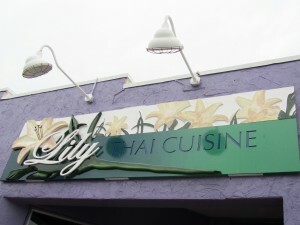 We got hungry and stopped at Lily Thai Cuisine. 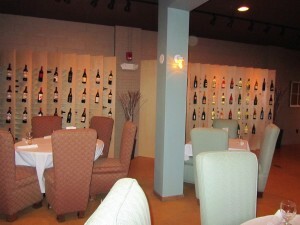 This Thai restaurant is located at 10 North 1st St. in Rehoboth Beach. Tel. 302-227-3348. 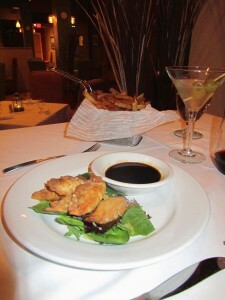 Ever since I found this restaurant I have been enjoying Lily’s great cuisine. I do. I really like it. When I first started going there you could bring your own bottle (BYOB). Then, they went through the process of applying for a liquor license and no bottles were allowed in the premises. Therefore, it has been somewhat slow. Next week, might be the week where they will be able to serve beer and wine. They will start with that; see what their customers will be requesting and take it from there. If you want to make sure they are serving beer and wine, please give them a call to 302-227-3348. They open for lunch and dinner. Closed on Mondays, though. They have great lunch specials for $8.95. Salad and half size entrees. Michael and I ordered the Larb Gai. I order this dish all the time. 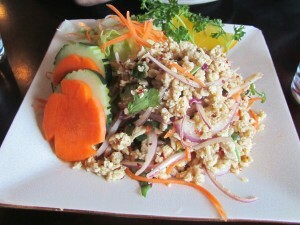 It has ground chicken breast, tossed in lime juice, red onions, Thai herbs and fresh mint. It is spicy and a favorite. Michael liked it but not as much as I did. 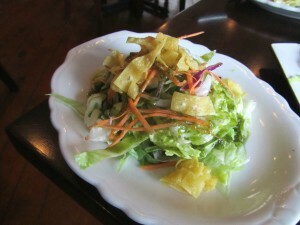 The salad that came with the lunch specials had a very interesting dressing. It was somewhat sweet but the concentration was cilantro. Refreshing after the spicy Larb Gai. 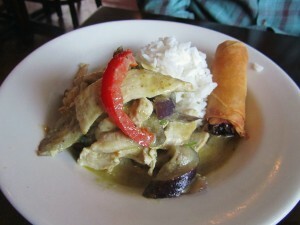 Michael had the Green Curry which was hot hot and spicy. This dish is traditionally made with green curry paste, coconut milk, Thai eggplants, and hints of Rhizome and basil. Got good reviews from Michael. A rhizome is the horizontal stem of a plant that is usually found underground, often sending out roots and shoots from its nods; ginger being a good example. Mine was a Crispy Duck Ginger. 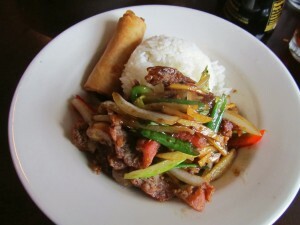 It was crispy honey duck with young ginger, onions, mushrooms, celery, garlic, ground peppers and scallions. It had just the right amount of spice and the duck was nice and crispy. Lily Thai is a quiet place for lunch. I think people forget that it is there. Anyway, I am passing the word around because I really do enjoy it. Note: Carry out is available. 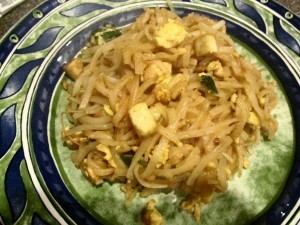 Phad Thai is one of Thailand’s national dishes. 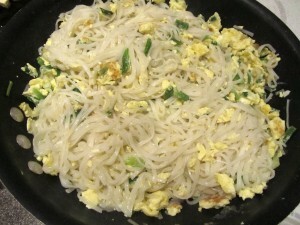 It consists of stir-fried rice noodles with eggs and fish sauce; other combinations can be added like bean sprouts, beef, shrimp, chicken or tofu. Crushed peanuts is the garnish that finishes the dish. Last night I was in one of those moods. A simple recipe that would not take long and pretty much a one dish meal. Most of Thai food is gluten free, so this was a no brainer. I added tofu, but it is not necessary. In a large bowl soak rice sticks for about 45 minutes, until tender, but firm. 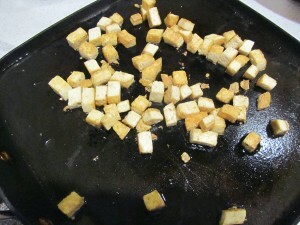 In a skillet put 1 tablespoon of oil and fry the tofu pieces until they brown but do not burn. Take them out and put them aside. In a large frying pan, large enough that the noodles will fit when added, put the 3 tablespoons of oil in a medium high heat. 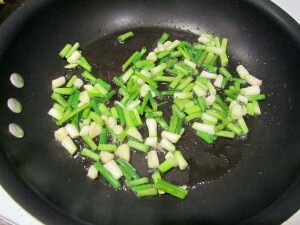 Add the garlic and then the green onions; stir fry for a few minutes. 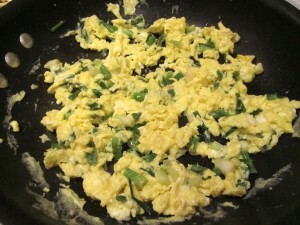 Add the eggs and scramble them until done. 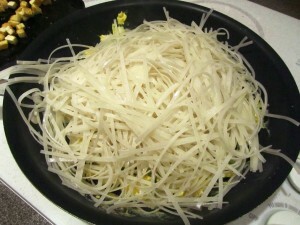 Drain the rice sticks well and add to the egg mixture. Even though it looks like a lot in the pan, they will cook down. Keep stir frying until the rice stick become translucent, at the same time adding chicken broth to the frying pan. Stir fry away. You might not need all the chicken broth. I usually do use that amount of broth, though. When the rice sticks begin to stick together then add the fish sauce, sugar and paprika and bean sprouts. Then, add the tofu if desired or shrimp, beef, chicken, or nothing at all. 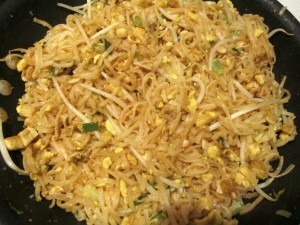 Continue to cook until dry; add crushed peanuts and serve. This particular dish is not spicy. If you would like to add a little kick to it, just add a chili pepper or your favorite “heat”. Please note that this recipe will serve 4 hungry people. Otherwise, leftovers will be great the next day. Have a great day!! !……talk to you soon…. Fundraising Event, The St. Thomas More Ravens, The Wesley College Wolverines, Dover, At Abbott’s Grill, Milford, Delaware, Sunday, 2/27/11, 1:00 p.m. – 5:00 p.m. I think this event should be put on the “to do” list for this coming Sunday. I am giving you the information now so that you can make plans. This fundraising event will be helping two schools very close to the Delaware Beaches. The event will be at Abbott’s Grill, at 249 NE Front St., Milford, DE 19963. The website for the restaurant is http://www.abbottsgrillde.com. This restaurant is a very popular one near the beaches, also owned by another very popular restaurant in Rehoboth Beach called Nage. St. Thomas More Preparatory School is located at 139 Thomas Drive, Magnolia, Delaware. The school is a private independent Catholic High School. The website is http://www.saintmore.org. 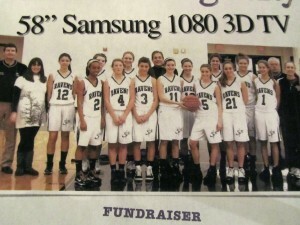 The funds raised on Sunday will help the school’s women’s basketball team, The Ravens. Wesley College is located at 120 North State St., Dover, Delaware. It is Delaware’s oldest private college founded in 1873. The website is http://www.wesley.edu. 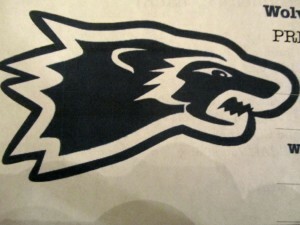 The funds raised on Sunday will also be helping the Wesley’s women’s basketball team, The Wolverines. So, mark your calendar. The event will start Sunday at 1:00 p.m. until 5:00 p.m. $20 will include buffet and two drink tickets. Subs and snacks will also be available. But that is not all; the Raffle Drawing is a 58″ Samsung 1080 3D T.V. There will be games, prizes, and a silent auction. Phillies Baseball Tickets, Orioles Baseball Tickets, University of Delaware Football Tickets, University of Delaware Women’s Basketball Tickets, Flyers Hockey Tickets, Washington Wizard’s Skybox Tickets, 4 some packages for Kings Creek Golf, Wild Quail Golf, Peninsula Golf, Rookery Golf, and Jonathan’s Landing Golf, multiple restaurant gift certificates, Midway Movie Theater passes, Two night stay at Hampton Inn in Rehoboth Beach, 60 minute massage, Lady Ravens Player Artwork and Bad Hair Day haircuts. There will be fun games so be prepared to have a good time. The idea is to raise funds for these two teams and I hope you will be part of this good cause. Thanks!! Comments Off on Fundraising Event, The St. Thomas More Ravens, The Wesley College Wolverines, Dover, At Abbott’s Grill, Milford, Delaware, Sunday, 2/27/11, 1:00 p.m. – 5:00 p.m.
We did not know what the weather was going to do today, but Paula and I did not care. All we wanted to do was sit, have a cup of coffee and probably a bite to eat for breakfast. Yes, we had to catch up. She is part of that group of friends that are considered my “partners in crime”. We decided to go to The Gallery Espresso. Neither Paula nor I had been there. Downtown Rehoboth was crowded. Long week-ends are usually pretty busy this time of the year even if it is cold. 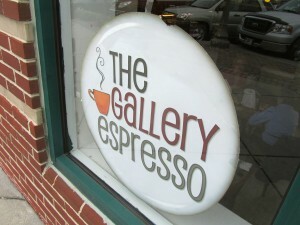 The Gallery Espresso is located at 70 Rehoboth Ave., in the 1st Street Station. Tel. 302-231-2113. There is a website, http://www.thegalleryespresso.com. I tried to visit the website but did not open up. They could be working on it so I am going to confirm that it is the right one. 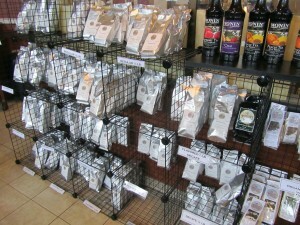 This is a coffee shop but it has an added twist; an art gallery and retail items. That side of the coffee shop is being set up so not everything was in place. They are going into their 3rd year in this location. 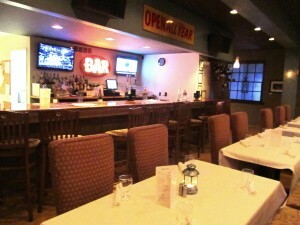 During the warmer months you can enjoy outdoor seating; a few tables are available. Please note that they serve all day breakfast and lunch. 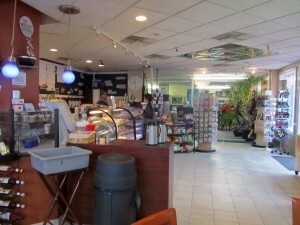 The coffee shop is owned by John and Judy. John took care of us this morning. I did not know what to order. They had burritos, egg sandwiches, crepes, hot sandwiches, grilled wraps, salads and grilled paninis. For the young at heart they have oatmeal, grilled cheese, grilled peanut butter, peanut butter and jelly and peanut butter and fluff. At first I wanted a crepe but they were dessert crepes. John suggested the grilled panini. I had an Egg’n Cheese Panini; swiss and ham on herbed grilled multigrain panini. It was pretty big. I don’t know why I say this because I really ate the whole thing. 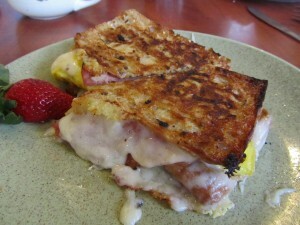 It was nicely grilled and the combination of swiss cheese, ham and eggs, well, you know how it is…good!! Paula was not that far behind because she chose the French Toast. These were big slices of French bread with buttered maple syrup. She did not have any problems eating this either. 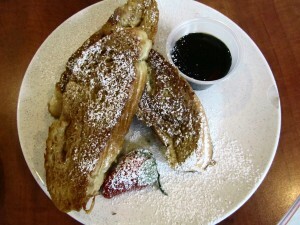 I love French toast when is made with French bread; a different flavor and consistency. Coffee and chatting. My coffee was bold, served in a large cup. Their espresso is imported from Italy. You can buy their brand of coffee right there, as well. I could not believe we were there for over 3 hours solving the world problems, and also our own. Then we took a look at a dish going by. They were beautiful crepes. I just got up and went to the next door table and asked them if I could take a picture of the Banana Caramel Crepes. 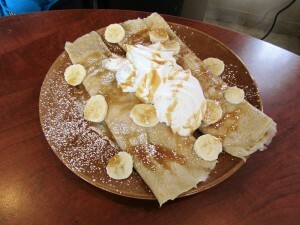 There were 2 crepes filled with fresh bananas, Ghiradelli caramel sauce and whipped cream. They really did look delicious. I always approach the gluten free factor and John told me that this summer they are planning to offer some gluten free items. The Gallery Espresso was relaxing; perfect place to work on your computer, read the paper; or just enjoy another day at the beach. 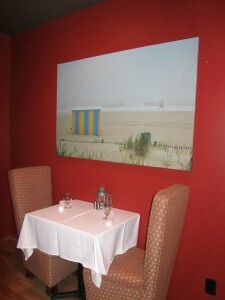 Last September 9, 2010, I went to dinner with friends to a very popular restaurant in Rehoboth Beach called Eden. You can read this post if you click on the month of September on the left hand side of this website and scroll down to the date. On that night I happened to look across the street and saw a new restaurant that I did not know about. It was JAM; also owned by Eden; recently opened. A mental note to visit this restaurant some time soon. Well, it has been more than a few months so on Friday, Linda, Harry, John and I decided to check it out. I had previously called to find out if they were aware of gluten allergies. They said yes and to inform the waitress. 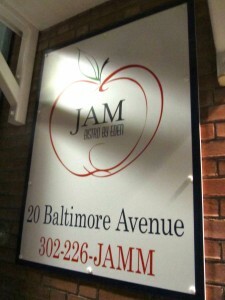 JAM is located at 20 Baltimore Ave., Rehoboth Beach, DE 19971. Tel. is 302-226-5266. Website? 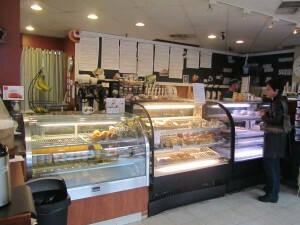 www.jambistro.com. It is open Thursdays and Fridays from 5:00 p.m. and Saturdays and Sundays from 11:100 a.m. E-mail is info@edenrestaurant.com. Linda and Harry are game to try something new even though at times I see a hesitation when I suggest to go to a new place. It was pretty funny when a couple of years ago I took them to the Grove Market in Bishopville, MD. Linda did not know what to think when we arrived. On Saturday, it was the perfect night to go out. We needed to catch up. When the 4 of us get together is non-stop talking and laughter. I had no preconceived ideas about JAM. Did not even read a review; I wanted to see for myself. 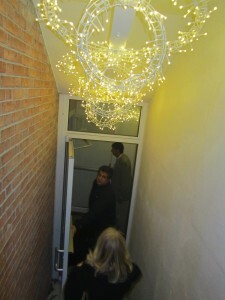 A flight down a set of stairs and then you enter to a surprise. From the outside JAM is so deceiving. I thought it would be small but it was not. A large room with tables scattered throughout and tablecloths. A partition divided a bar with tables set for dinner. We decided to sit in the larger dining room. The colors and art were very pretty. JAM is a casual restaurant. We live at the beach; it should be that way. Amy was our waitress and she was very friendly. Throughout our meal she stopped at the table to see if we needed anything; very unobtrusive. She let us talk and talk and talk. 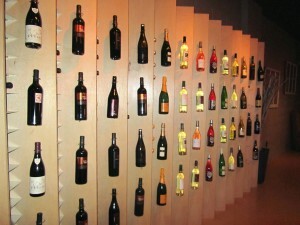 At JAM you can order every wine by the glass, but what got rave reviews was the Dirty Martini. 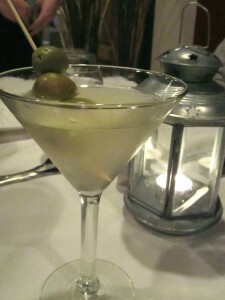 It came just like a dirty martini should; cloudy. Crispy smashed firgerlings with smoked bacon and vermont cheddar, Old Bay and tartar sauce. They were crispy and you could definitely taste the Old Bay. Shrimp dumplings, lemongrass broth, green, yuzu/truffle dressing. Yuzu is a sour Japanese citrus fruit; the rind predominantly used. Seasoned well with a nice flaky crust. 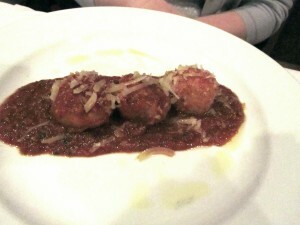 House made meatballs, tomato gravy and shaved parmesan was another appetizer ordered, but Linda has been perfecting meatballs at home and thought hers were better. 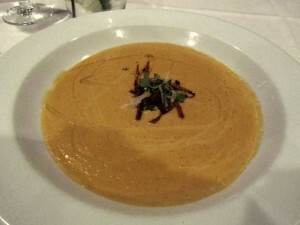 I went with the $30 prix fixe menu and I chose the roasted carrot and ginger soup with fried parsnips chips. It was delicious and I hope I can get the recipe. More wine and more dry martinis followed. Then for our entrees we ordered. 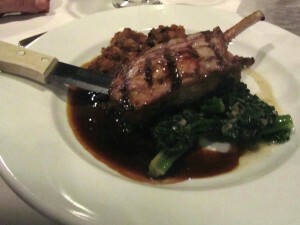 Grilled Pork Chop and a side of broccolini over mashed potatoes. It looked beautiful. 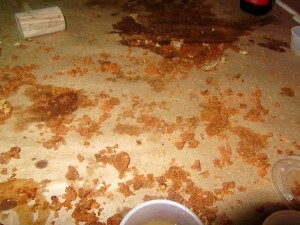 Harry said it was delicious; not dry and great gravy. 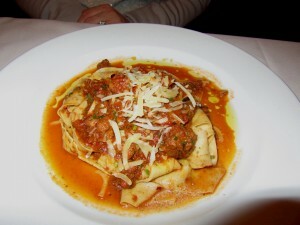 Linda had the Pappardelle Bolognese which was a house made pasta with shaved pecorino and olive oil. I think she liked it but, again, she has been experimenting a lot with her own Bolognese sauce and she thought hers was so good. She is inviting us to sample her Italian cooking. A post will be coming soon. 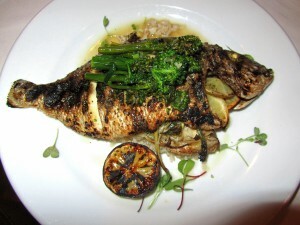 John and I chose the Grilled Whole Silver Snapper that came over jasmine rice, garlic broccolini and a preserved orange vinaigrette. Amy suggested we had this entree and it truly was delicious. It was a white flaky fish with mild flavor; seasoned and cooked to perfection. A word of caution. If you do not like to see a whole fish then don’t order it. That has never bothered me. Also if you don’t like the idea of picking thrugh fishbones, then don’t order it either. You will be missing a great tasting fish, though. We had to try the desserts and a outrageous dark chocolate brownie was ordered with vanilla bean ice cream, and caramel krispies. 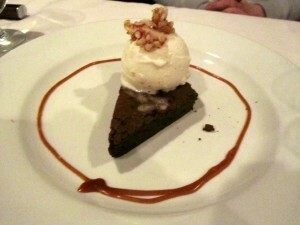 The brownie was dense and sweet, just as it should be. 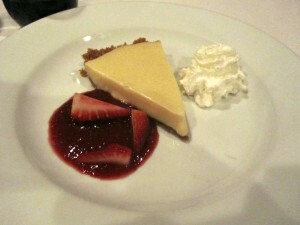 My Key Lime Pie was also perfect. Tart; not too sweet, just the way I like it. Coffee and laughter was the perfect ending to a perfect evening……friends, always there….I love it that way…. P.S. I must be hitting all the restaurants at the right time because to tell you the truth most of them have been good with just a few having bad nights. I hope that’s what they had.